During the week at St Peter’s, the children have welcomed special guests to enhance their learning. The youngest pupils in the school played host to Fr Jeremy from the Church of the Sacred Heart and St Peter the Apostle. 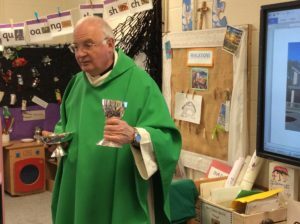 As part of the RE curriculum, Fr Jeremy brought vestments and chalices into school to explain to the children their significance in Mass. Rather bravely, Fr Jeremy also took questions from the 4 and 5 year old pupils, which ranged from the perceptive to the perplexing! Thank you Fr Jeremy for helping the children with their learning. Meanwhile, we had canine company for a recent assembly at St Peter’s. 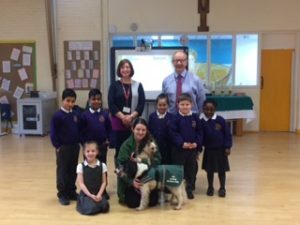 Havant Borough Council’s Animal Welfare Service team deliver an assembly to help children to learn how to approach dogs with care and caution when out in public, and what to do if they felt worried by a stray dog they may meet outdoors. Natalie and Jaz from the Borough Council brought along Darcy and Zak as fine doggy models, and many children had the chance for a quick pat of the dogs at the end of the assembly. Thank you to our local authority for providing the outreach education work. And that brings to an end a week where we were expecting a new building and lots of snow, neither of which arrived! Thank you all for your patience and efforts in keeping up to date via parent mail and the school website, we will pass information about the new delivery date for the building as soon as we have it confirmed.